When you become a parent it seems like you have a ton of questions and not a lot of answers. Wouldn’t it be nice to have a place you could go that helps prepare you to become a parent? You would learn what to eat (and not to eat) during pregnancy, talk about challenges you may face during breastfeeding and receive support along the way, learn how to read food labels so you actually understand them—and then have classes on how to cook healthy foods so your kids love them. Have other health concerns? You would be connected to the health care resources you need. Millions of moms have found a safe haven in a place just like this for the past forty years: the WIC Program (Special Supplemental Nutrition Program for Women, Infants and Children). You may or may not be familiar with WIC. You may think it’s Food Stamps for pregnant women. You may think it provides “milk and cheese.” It’s true that WIC is a federal nutrition program, but it’s so much more than just food. Parenthood undoubtedly poses challenges for all of us, but having a trusted place to find answers helps empower us to become the confident caregivers we want to be. This is the heart of WIC services. Credentialed professionals provide nutrition and breastfeeding services and answer questions moms have about pregnancy and postpartum challenges. The National WIC Association’s theme for the 40th Anniversary of WIC—WIC: Strengthening Families for 40 Years—helps showcase how the WIC Program is one of our country’s most important public health programs, and how it has enriched the lives of millions of families over the years. We will be spotlighting the four main service elements of WIC, their roles in the program, and their proven track records of improving healthy pregnancies and birth outcomes, reducing infant mortality, and preparing kids to be ready to learn. WIC provides benefits to access specific healthy foods such as whole grains, low-fat dairy, fish, fruits and vegetables. WIC provides nutrition education; families learn to shop, cook, and eat healthfully. 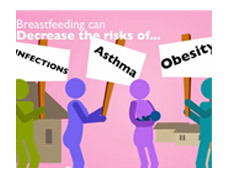 WIC provides breastfeeding education and support. WIC connects families to the healthcare they need with referrals. WIC serves nearly 9 million low-income mothers and young children monthly, including 53% of all infants born in the U.S. Since the program’s inception in 1974, WIC has consistently and successfully improved health outcomes in the population it serves. Help us bring awareness to the value of WIC services and celebrate four decades of WIC successes! Check out our special anniversary website WICturns40.org dedicated to shareable anniversary materials, resources, and a calendar of events. Questions about the materials? email slee@nwica.org.